This article is about the 1973 film. For the 2009 film, see O Lucky Man! (2009 film). O Lucky Man! is a 1973 British comedy-drama fantasy film, intended as an allegory on life in a capitalist society. 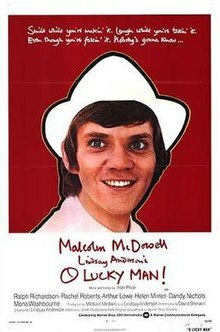 Directed by Lindsay Anderson, it stars Malcolm McDowell as Mick Travis, whom McDowell had first played as a disaffected public schoolboy in his first film performance in Anderson's film if.... (1968). The film was entered into the 1973 Cannes Film Festival. The film opens with a short fragment outside the plot. Grainy, black-and-white, and silent, a title "Once Upon a Time" leads to Latino labourers picking coffee beans while armed foremen push rudely between them. One worker (McDowell with black hair and moustache) pockets a few beans ("Coffee for the Breakfast Table") but is seen by a foreman. He is next seen before a fat Caucasian magistrate who slobbers as he removes his cigar only to say "Guilty." The foreman draws his machete and lays it across the unfortunate laborer's wrists, bound to a wooden block, revealing that he is to lose his hands for the theft of a few beans. The machete rises, falls, and we see McDowell draw back in a silent scream. The scene blacks out, the word NOW appears onscreen and expands quickly to fill it. During his journey, Travis learns the lesson, reinforced by numerous songs in the soundtrack by Alan Price, that he must abandon his principles in order to succeed, but unlike the other characters he meets he must retain a detached idealism that will allow him to distance himself from the evils of the world. Travis progresses from coffee salesman (working for Imperial Coffee in the North East of England and Scotland) to a victim of torture in a government installation and a medical research subject, under the supervision of Dr Millar. In parallel with Travis' experiences, the film shows 1960s Britain retreating from its imperial past, but managing to retain some influence in the world by means of corrupt dealings with foreign dictators. After finding out his girlfriend is the daughter of Sir James Burgess, an evil industrialist, he is appointed Burgess' personal assistant. With Dr Munda, the dictator of Zingara, a brutal police state which nevertheless manages to be a playground for wealthy people from the developed world, Burgess sells the regime a chemical called PL45 'Honey' for spraying on rebel areas (the effects resemble those of napalm). Burgess connives at having Travis found guilty of fraud, and he is imprisoned for five years. The film then cuts to five years on, when Travis has finished his sentence, become a model prisoner, and converted to Humanism. He is quickly faced with a bewildering series of assaults upon his new-found idealism, culminating in a scene in which he is attacked by down and outs whom he has been trying to help. The final scene of the film shows him becoming involved in a casting call for a film, with Lindsay Anderson himself playing the director of the film. He is given various props to handle, including a stack of schoolbooks and a machine gun. When asked to smile Mick continually asks why. The director slaps Travis with his script book after he fails to understand what is being asked of him. After a cut to black (a device used throughout the film) a slow look of understanding crosses Mick's face. The scene then cuts to a party with dancing which includes all of the cast celebrating. Many of the actors play several roles. The film originally began as a script written by McDowell about his experiences as a coffee salesman in his late teens and early 20s. Anderson was unhappy with this treatment, and David Sherwin worked on the script. Sherwin though was undergoing personal problems at the time, which necessitated Anderson writing a few scenes himself, a skill he did not feel he had. Anderson found working with Czech cinematographer Miroslav Ondříček much less rewarding than he had on if..... He also doubted his own skills as a director during the film's making, and felt that the film had insufficient preparation. The role of Patricia was recast during production. Originally, Fiona Lewis, best known for appearing in several horror films around this time, played the role. Britannia Hospital (1982) completes the trilogy of films featuring Mick Travis, which also sees the return of Dr Millar. Alan Price said Lindsay Anderson wanted to make a documentary about Price and his band touring England, but the cost of licensing songs they performed was too high. As Sherwin and McDowell developed the script, Anderson decided Price should write the score and sent him the script, indicating where he would like songs to appear. Price wrote nearly all the songs before filming started. Anderson conceived of Price's role as a kind of Greek Chorus, both commenting on and finally appearing as part of the action. The soundtrack was released as a vinyl album, by Warner Bros. Records, in 1973. In the U.S., it entered the Top LPs & Tape chart on August 11, 1973, and spent 14 weeks on the chart, peaking at no. 117. Reviewing for Creem in 1973, Robert Christgau said, "How does an acerbic, good-humored music journeyman like Price (find: This Price is Right, on Parrot) fall in with a pompous, overfed con man like Lindsay Anderson? By playing the Acerbic, Good-Humoured Music Journeyman Symbol in a pompous, overfed movie. Two or three deft political songs do not redeem an LP that runs under 25 minutes despite filler. It figures—the movie is an hour (or three hours) too long." The song "Changes" (based on the tune to "What a Friend We Have in Jesus") was later a chart hit for Price in April 1988 when it was used in a popular 1987 TV advert for Volkswagen Golf cars, starring model Paula Hamilton. The song "Sell Sell" was recorded by Widespread Panic for their twelfth studio album Street Dogs and has been performed by the band on several occasions beginning on 19 February 2012 in Aspen, Colorado for the final night of their Wood Tour. The film received a mixed-to-negative review in The New York Times, with Vincent Canby saying "Staying with it through its almost three-hour running time becomes increasingly nerve-racking, like watching superimposed images that never synchronize. The result does not match the ambition of the intention. The wit is too small, too perfunctory, for the grand plan of the film and the quality of the production itself." Rotten Tomatoes surveyed 17 critics and determined that 82% of the reviews were positive with a rating average of 4.1 out of 5. A number of different edits exist, with some American prints removing around twenty minutes including the working class parody suicide, just before the conclusion of the film. Even both British VHS releases delete at least one scene present in the BBC broadcast of the film (Travis testing his status in the home of his industrialist patron) in the early eighties. The Swedish cut of the film runs to only 168 minutes, eliminating 15 minutes of the original. A 2-disc special edition Region 1 DVD was released 30 October 2007. ^ "O LUCKY MAN (X)". British Board of Film Classification. 25 April 1973. Retrieved 4 June 2013. ^ "Festival de Cannes: O Lucky Man!". festival-cannes.com. Retrieved 19 April 2009. ^ "allmovie.com O Lucky Man! overview". Retrieved 9 February 2007. ^ Price, Alan (score) (30 October 2007). O Lucky Man! (DVD audio commentary track). Burbank, CA: Warner Bros.
^ "Alan Price - O Lucky Man! - The Original Soundtrack". discogs.com. Retrieved 24 April 2017. ^ Whitburn, Joel (1996). Top Pop Albums 1955-1996. Record Research Inc. p. 623. ISBN 0-89820-117-9. ^ Christgau, Robert (November 1973). "The Christgau Consumer Guide". Creem. Retrieved 3 September 2018. ^ "Everyday Companion Online - Sell Sell". everydaycompanion.com. Retrieved 24 April 2017.